Today I want to show you the technique I use to attach closed-top limbs, like Rumi's or Ami's arms, to the body. 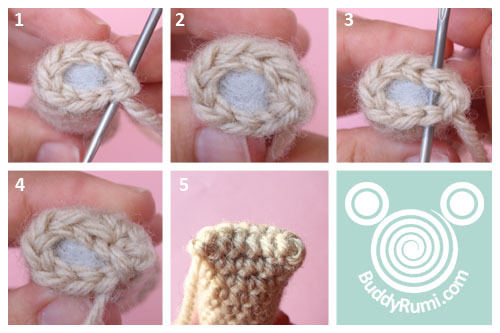 The first thing we need to do when we finish the limb is to close it so that the stuffing doesn't come out. 1. Insert needle into the first pair of stitches. 3. Insert needle into the next pair of stitches. 4. Pull yarn to close. Repeat steps 3 and 4 until the top is completely closed. Next we need to find the right place for our limb and attach it. 1. With the help of some pins try out the place where you want the limb of the amigurumi to be. View it from diferent angles ( from the side, front...) to be sure it looks good. Once you have the right place begin to attach it. 2. Insert needle into the stitch directly under the top of the limb. 3. The picture shows step 2 with the arm out of the way for clarity reasons only. 4. Insert needle into the top of the limb, from the front of the limb to the back. Repeat steps 2 and 4 until all of the top portion of the limb is securely attached. 5. Finish off and secure yarn under the arm. Weave in end. Do you use a diferent technique?